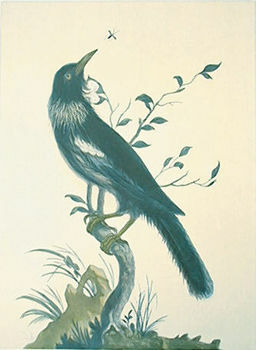 The Poa (New Zealand tui; Prosthemadera nova zelandiae) engraved and printed by Robert Laurie. A tale from Early Prints of New Zealand. This print is a personal favourite and the story behind the picture is one of the most interesting related to any early New Zealand print. Captain James Cook reached England on 30th July 1775 at the conclusion of his second voyage of discovery. Among the items he brought back was a tui, stuffed (rather meagrely) and mounted. The excitement generated by Cook's exploits was infectious, and one of those affected was young Robert Laurie a Scottish designer who was at the time working to perfect a method of printing in oil colours. 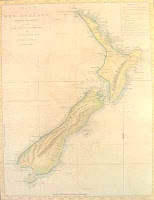 Laurie seized the opportunity to select for his first print in the new process an item associated with Cook's voyage and his choice is forever associated with New Zealand. In March 1776 he wrote to the Society of Arts, and the correspondence which ensued seems both important and charming enough to be quoted fully. As the ingenious & Laborious Works of many Eminent Men, have been ushered into the World, with inelegant & Unexpensive Cutts in them, principally owing to the vast Expence attending the Performanse of them, induced me to Attempt this Method of Engraving, which I have found to Answer my most sanguine Expectation, not only for the Ease they may be Executed with but Also the Expedition, & Consequently less Expence, — In this Manner Animals Plants &c for Illustrating Natural History, may be finish'd very near Nature & in the Proper Colours much Resembling a Drawing, the Plates of which may be repair'd so as to Admit a large Impression. If this my first Attempt should meet with your Approbation; it will Encourage me under your Protection to proceed on a more Extensive Plan. The Bird here Represented is from one which Capt. Cook brought from between the Tropic's; caught in his last Voyage round the World — the Plate of which I beg leave to lay before your Honourable Society ..."
Resolved to recommend to the Society to give a Bounty of Thirty Guineas to Mr Laurie he laying open the Method of doing it for the Benefit of the Public . . ."
Resolved that the Committee be Summoned to meet ... to see the manner in which Mezzotinto Prints in Colour are taken from the Plates . . ."
"At Mr Smiths Copper Plate Printer in Kings Head Court near Gough Square . . . The Committee saw the method of taking in Colours from Mezzotinto Plates, as Invented by Mr Laurie, which was performed by Mr Smith who had never executed that kind of work before that morning. First a Bird from the Plate produced to the Society. The Committee also saw the Impressions taken from a Smaller Plate of a Head entitled Innocence and two impressions of each of these Plates are reserved for the Society . . ."
— The Plate being warmed in the usual manner, the colours are applied by means of stump Camel hair Pencils to the different parts as the subject suggests, it is then wiped with a coarse gauze Canvass, any other being improper, it is after that wiped clean with the hand as in common practice and being again warmed is passed thro' the Press. — The Colours are mixed with the burnt Linseed Oil and those generally used by Painters are proper. Attested by me Robt Laurie /Etat: 20"
"Mr Laurie to whom a Bounty of Thirty Guineas had been voted for his having disclosed his Manner of printing Mezzotinto in Colours attended gave Satisfaction and received the Bounty." The Committee also ordered that "one of the Impressions (in Colours) of the Bird be framed and Glazed and the others carefully preserved in the Societys Collection." It is an interesting sidelight that when Laurie issued the print commercially, he described the award as a 'Premium' of thirty guineas, not a 'Bounty'. A premium was awarded after previous public announcement and was in a sense a prize in competition; a bounty was awarded for items or ideas submitted non-competitively. Using the same plate, Laurie re-issued the print in 1784 and it is believed, produced a third edition at some time between 1784 and 1795 - these later issues bearing new text. Laurie's printing in oil colours, as well as pre-dating George Baxter [George Baxter (1804 - 1867) is regarded as the inventor of colour printing. The Baxter process which was patented in 1835 involved an initial metal keyplate and up to 20 wood or metal blocks to apply each individual colour all printed on hand presses. Baxter mixed all his own oil inks and each colour or layer of oil ink was built up to create a miniature oil painting - art for the masses. Apart from the sale of 'Oil Pictures' his prints were used to illustrate books, his 'Cabinet of Paintings' was the first to be published in full colour.] by almost sixty years and was done from copper plates and not from wooden blocks. Printing in colour did not become established as a normal commercial process until even later in the nineteenth century when lithography was developed so Robert Laurie was almost a century ahead in his methods when he printed the "Poa" print. The authors' copy of The Poa was found mounted in a volume of old prints under a house: the stained and dirty book was on its way to the rubbish tip when it was rescued. Enquiry revealed the scarcity of the print, and at the time Murray-Oliver's Captain Cook's Artists in the Pacific, 1769-1779 was published, it was believed only four copies existed. An untitled print, inscribed on the back: "Given by Capt. Cook the Circumnavigator to Robt. Laurie — who invented the art of Printing in Oil Colours — of which this plate was the first specimen — and he received from the Society of Arts in the Adelphi a premium and a medal for the same"
This copy, formerly in the possession of Capt. A. W. F. Fuller, was presented to the Mitchell Library in 1963 by his widow. It had been exhibited in 1937 by the Royal Society of Arts, and is believed to be the hand-coloured copy used by Laurie as a guide to colouring the mezzotint plate. 2. The Royal Society for the Encouragement of Arts Manufactures and Commerce, London An untitled print, framed, one of the two printed before the members of the Committee of Polite Arts on 21st November 1776. (The second copy cannot now be traced.) The mount is titled: Mezzotint by Robert Lawrie (aged 20) Awarded a Bounty by the Society in 1776. The Bird is copied from one which Captain Cook brought back from his last voyage. This copy is a mezzotint in colour. The Poa./Robt. Laurie. Del. et feet./From the Bird which was brought from New Zeeland by Capt. Cook, in his late Voyage round the World. And which Obtained of the Society of Arts, a premium of 30 Guineas.—/Sold at No. 1 Johnsons Court, Fleet Street, & No. 37, Maiden Lane, Covent Garden. These copies are in black and white only, and may have been run to test black inking. Mezzotints in colour, from the same plate as the British Museum copy, and bearing the same text. All ten prints seem to be taken from the same printing plate, on the evidence of tiny marks which occur on each. Platemark size is 35.5 x 25cm. There may have been another issue, no copies of which have been traced. It is listed in: Laurie & Whittle; Catalogue of new and interesting prints . . . 1795. The Poa bird, drawn from nature, brought back by the late Captain James Cook from the Sandwich Islands, printed in colours, 7/6. The authors are particularly indebted to the Royal Society of Arts for their permission to quote so extensively from the Minutes of Committees. The Poa print was reissued by Avon Fine Prints in the 1960s in an edition of 750 prints, these were in a slighter larger size than the original print and all have Avon Fine Prints printed beneath the image.